Bonehead has kindly provided a server on which Im running 2 condor dedicated servers now, called BFS 1 &2. Bone has started using Condor himself and seems to love it, but it would be nice to see some more familiar BFS pilots give this simulator a try, especially now that it supports VR. Unfortunately there is no free trial version, and I understand you may not want to spend 60 euros on something you dont know you will like, but if so, send me a PM, I might be able to arrange something so you can test it. Besides condor, you will need some other things to get the best experience. If you dont have VR or 6DoF trackir, also map “panel zoom” so you can actually read the flight computer. – gear, water ballast, tow release, wheel brake, extract motor, start motor, .. If you are new to soaring, I highly recommend going through the built-in flight school lessons. You shouldnt have much problems actually flying the planes if you are a flight sim veteran. Even the tow should feel familiar, its just like dogfighting and lining up your gunsight (aim for the outer wing tip). But you will need to learn about centering thermals, ridge flying and wave, and while you may know about energy management, this takes it to a whole new level and to be at all competitive, you will need to learn some strategies like McCready theory to give you an idea how fast you should fly ideally in what conditions. You have instruments to help you out, but you need to learn to use them. You will also need to learn to fly with flaps if you fly 15m, 18m or open class planes (trainers, standard class and the current double seaters dont have flaps). To know which flap settings are ideal at which speeds, I highly recommend installing a modded ASI face plate with flap markings. The indications are only valid for 1G and maximum ballast, but will at least give you a rough idea. 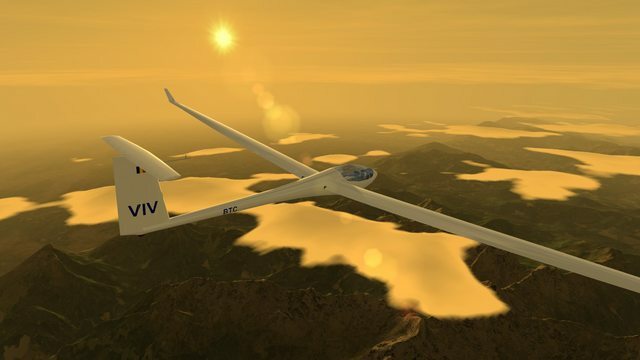 Once you are at ease flying gliders, make a habit out of fully loading your glider with water ballast. The high wing loading dramatically changes flight characteristics, it makes you fly a lot faster (and even further) in anything but the weakest conditions, but it also makes the plane stall much more easily and makes thermalling more challenging. In condor tasks, weather tends to range from pretty good to bombastic, so you will generally always fly with max ballast. Just dump it before landing. Its unrealistic to download it from condor club if you dont have a premium account there, but they provide link to 1fichier which should work even without any account. More are added pretty much weekly. You can download them too from that site, but for non paying users, it takes.. a while. Last edited by Skinny; 21-02-2019 at 08:34. Ive copied this over to the old gits website simply to keep it safe because im going to rebuild the forums and B-F website and didnt want to lose this. I'll give this a go when I get my new pedals. Being truthful, it doesn't sound like my cuppa tea. How long do the races last in general? Is it more of a chill out thing? It all varies. Most races are slightly above 1 hour, but they can be as short as 40 minutes or as long as 3+ hours. Add to that 0-30+ minutes "warmup", depending on server settings; that is the time everyone is towed up, climbs to altitude and waits for a good moment to cross the start line, as in most races you can chose when you start within a predefined time window. Is it a chill out thing? Well it can be, if you dont race and just want to enjoy a scenic flight alone or with friends, especially wave flights or easy ridge flying where you are high and there is no stress. But if you fly competitively it can be very intense for the majority of the race time. To illustrate, I have a cat that always wants to go outside around the time I fly, it takes me about 10 seconds to go up and open the door, but I have to find a moment where I feel I can afford to put my plane on autopilot (think level stabilizer) for 10 seconds and the cat often needs to wait a long time . I find it more intense than IL2, but its different, probably more comparable to a long bomber flight in tight formation than dogfighting. Regatta is when there is no start time window, everyone needs to start at the same time, which can be chaotic and the first to finish is the winner. Usually its the one who flew fastest, but people can pick their own start time, so finishing first says nothing. To be fair I think the shorter ones would be OK for me. Much more than an hour and I run out of time really. Its the competative thing that I enjoy. Those long, multi hour races tend to be more "realistic" and more difficult, no miracles allowed, no icons or limited range, no realtime scoring etc. They are generally used in multi race competitions, and honestly, unless you care about your ranking in the competition, they can be a bit tedious or even boring (just finished the regatta cup race, 3 hours and it was boring as hell, I hope no one watched lol) . But the BFS server hosts some relatively short tasks, I designed them to be VR friendly : not much turbulence and doable in less than an hour, if you are good the ones I flew even ~45 minutes, and I dont waste time with slow tow procedures and long time windows. You airstart above the startline, there is a 10 minute jointime to allow others to join, and then the line opens and off you go. I called them "No Time To Waste" for a reason. Yet the tasks have fairly realistic weather and are challenging in different ways. Give them a try! Last edited by Skinny; 16-01-2019 at 22:19.
just a thought. maybe we should have just the standard map running on one of them for new people? Last edited by Skinny; 17-01-2019 at 16:13. BF1 (once its up again) has 2 out of 3 tasks on the default map. I dont want too much default maps because most people are pretty bored of slovenia. Fixed. Except for Hitzi's server list, but it works when you look at the official condor website server list. email is still busted. just reading through these posts. Check the IP's you are reading. the server is on a private IP. Ill post in the syndicate area here which is private. I also validated the tasks on condorclub. That way, if you have an account there (free account is enough) you can upload your flight track after the race (last flight track is saved in \documents\condor\flighttracks\lasttrack.ftr) and compare your result and even your flight path with that of others who flew the same race earlier. Think of it a mini competition, just not in real time. Also in-game you will get a chat message giving the best result for that task so far. Tasks that allow all planes are scored with a handicap factor depending on the plane. I will soon start a BF3 free flight server than can be joined at any time. Excellent. ill give it a go next week when i get time. Had a good laugh yesterday. Arc Alpin 2 scenery has finally been released. This scenery, covering the entire alps and wide surroundings has been highly anticipated ever since condor2 launched, 10 people worked on it for nearly a year. Even though its not quite done yet (eastern half still needs some work) this will pretty much become the de facto standard scenery, certainly for anything in the alps and wide surroundings. Its unrealistic to download it from condor club if you dont have a premium account there, but they also provide link to 1fichier which should work even without any account. Last edited by Skinny; 22-02-2019 at 13:05.